The lungs receive the entire output of the right ventricle. Consequently, pulmonary blood flow is equal to cardiac output, about 5 L/min. The normal transit time for blood through the pulmonary capillaries is about 0.75 seconds. Gas equilibration between the alveolar air and the pulmonary capillary takes about 0.25 seconds for O2 and about 0.05 seconds for CO2. This means that there is a large “safety factor” ensuring that gas equilibrates with pulmonary blood. Even during exercise, pulmonary capillary transit times remain sufficient to ensure adequate exchange. The longer time for O2 equilibration, however, means that in disease states, O2 exchange becomes limited more quickly than does CO2 exchange. Pulmonary vascular resistance is much lower than systemic vascular resistance, and blood pressures in the pulmonary system are much lower than the corresponding systemic vascular segments. Pulmonary arterial pressure is about 25/15 mm Hg, pulmonary capillary pressure about 12 mm Hg, and pulmonary venous pressure about 8 mm Hg. These pressures are recorded during the passage of a Swan-Ganz catheter from the systemic veins into the pulmonary artery. A small amount of systemic arterial blood flow, the bronchial circulation, supplies nutrient flow to the trachea, bronchi, and large thoracic blood vessels. Most of the bronchial circulation empties into the pulmonary veins, representing a source of O2-depleted blood that mixes with blood that absorbed O2 while passing through the pulmonary capillaries. This flow is part of normal right-to-left shunt flow and accounts for the pulmonary venous blood having a slightly lower O2 saturation than would otherwise be expected. In contrast to the systemic circulation, extravascular compression from the alveoli represents a significant component to pulmonary vascular resistance. This extravascular compression can come from interpleural pressures in the case of vessels outside the lungs, or from alveoli for pulmonary capillaries. At lung volumes approaching residual volume, the higher (less negative) interpleural pressure provides compression on the vessels outside the lung and increases pulmonary vascular resistance. At lung volumes approaching total lung capacity, expansion of alveoli provides compression of the pulmonary capillaries and increases pulmonary vascular resistance. The lowest total vascular resistance is at lung volumes approaching the functional residual capacity. The relatively low pressures in the pulmonary vasculature render pulmonary blood flow susceptible to changes due to gravity. 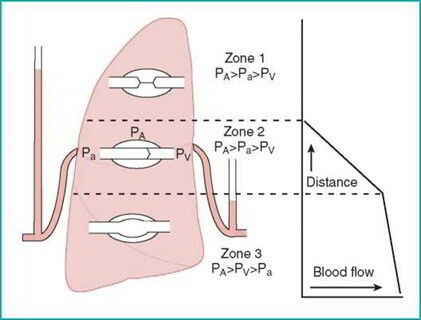 Pulmonary blood flow is highest in the base of the lungs (zone 3). If pulmonary venous pressure falls below alveolar pressure, the alveoli can limit blood flow (zone 2). If alveolar pressure exceeds pulmonary artery pressure, the alveoli can completely obstruct pulmonary blood flow (zone 1). Zone 1 represents a nonfunctional portion of the lung and does not occur physiologically. In disease states characterized by low pulmonary vascular pressure (e.g., hemorrhagic shock) or high alveolar pressure (i.e., positive pressure ventilation), zone 1 can develop and impair gas exchange. Blood flow in the lungs is affected by gravity and alveolar pressure. The base of the lungs receives the greatest amount of blood flow. Blood flow to the higher portions of the lungs is diminished because of lower pulmonary arterial pressure due to the effects of gravity. Alveolar pressure can limit perfusion if it exceeds pressure in the vascular system. This is unusual, but it can occur when alveolar pressure is very high or pulmonary vascular pressure is very low. Pulmonary vascular smooth muscle can play an important role in shunting blood away from unventilated portions of the lungs. In the lungs, hypoxia causes vasoconstriction (in contrast to the vasodilation in systemic vasculature). This allows pulmonary blood flow to be shunted to regions of the lung that are better ventilated. 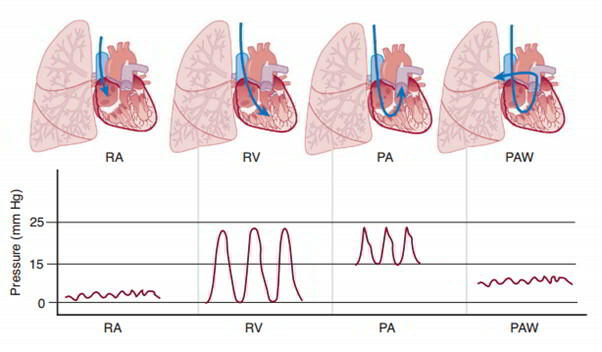 Hypoxic pulmonary vasoconstriction is the principal mechanism balancing pulmonary perfusion and alveolar ventilation.